Ontario Premier Dalton McGuinty has called on the federal government to support a program for supporting farmers in Niagara and other regions of the province. 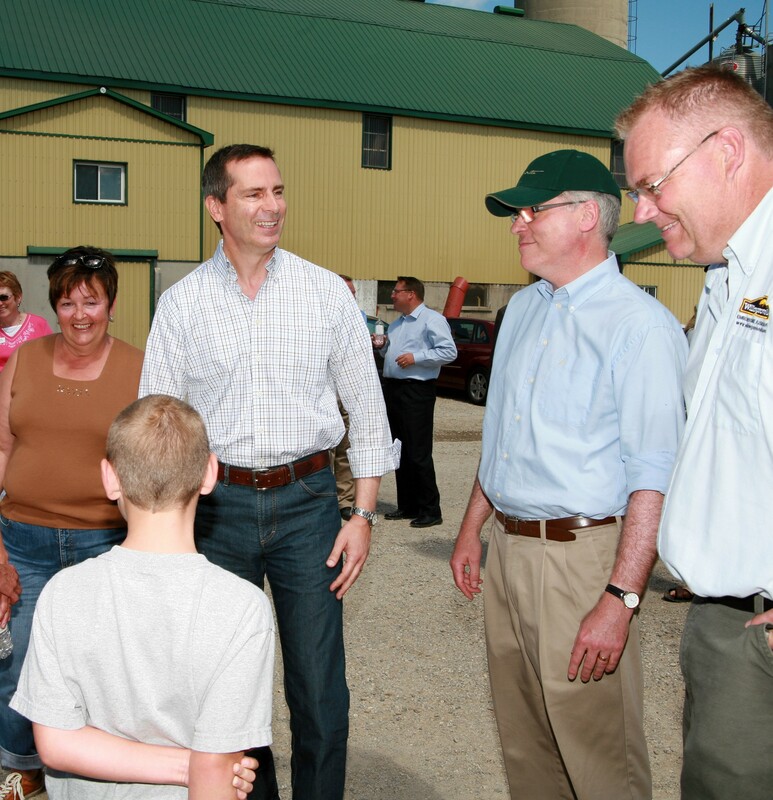 Ontario Premier Dalton McGuinty touring a Stratford, Ontario farm this July 26. Photo courtesy of premier's office. McGuinty made the call for federal support for the province’s ‘Risk Management Program’ for farmers while touring an antibiotic-free hog farm in Stratford, Ontario this Tuesday, July 26. “Our risk management program gives farmers stability, which builds a strong Ontario economy and jobs for a generation of farmers and workers. The federal government must do its party and support hard-working Ontario farmers and their families,” McGuinty is quoted saying in a media release. The new program, being supported with funds from provincial government, “gives farmers the stability and predictability that will help protect their farms and ensure Ontario families continue to enjoy healthy local foods. It works like insurance helping the cattle, hog, sheep and veal sectors, and grain and oil seed farmers. There is also a self-directed risk management program for fruit and vegetable farmers,” says the media release. There are more than 7,000 farms in Niagara, Ontario alone, contributing hundreds of millions of dollars annually to the local economy, according to a report published last year by the Brock University-based Niagara Community Observatory. The Ontario government notes that there are close to 60,000 farms in the province, employing about 700,000 people and contributing about $33 billion annually to the economy. You can find out more about this Ontario farm support program by visiting http://www.omafra.gov.on.ca/english/about/rmp.htm . Dalton McGuinty where have you been for the last 8 years? when the canning plant in St Davids was allowed to shut down and be sold by a New York holding company, taking our jobs and outlet for our fruit and vegetables, leaving our farmers without access to the Ontario market place.The Federal and Ontario governments put millions of tax dollars to upgrade the facilities. I smell an election coming. The Liberal PR Agenda doesn’t mention the significant challenge to farming sustainability in this country. As one of the few remaining sustainable farmers in the region told me, he/they can’t compete with the monster barges filled with produce from China. The above program seems good, but it’s basically a band aid approach. Trade deals need to be renegotiated.